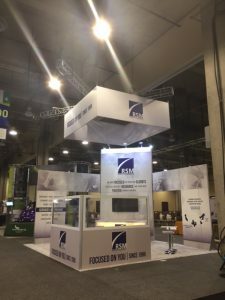 RSM Maintenance welcomed current and future clients to our newly designed booth at the Professional Retail Store Maintenance (PRSM) 2017 National Conference in Dallas, TX. More than 60 of RSM Maintenance’s 210+ clients stopped by our booth to review current and future business plans with us. “I worked on the redesign of our booth for the eight months prior to the show,” said Wayne Knaub, SVP of Sales and Marketing, “We knew we were going to make a splash with the new design, but didn’t expect all of the accolades from our clients, competitors and industry leaders. Knaub just ended his term on the PRSM board at the 2017 PRSM National Conference. He is a 16 year member of the organization and has served on the Board of Directors as both a retailer and supplier member which is highly uncommon. Several of our team members are actively involved in the PRSM organization. Former PRSM Board President Bryan Walker also works with RSM Maintenance as Director of Client Services. Walker attended the show and also participated in the PRSM Impact Volunteers of America Charity Project. Additionally, Betsy Renouf (National Accounts Manager) serves on the Awards Committee. Since 1998, RSM Maintenance provides facilities maintenance services and management on a national and regional level for more than 210 retailers, restaurants and other multi-site establishments in the United States, Canada and Puerto Rico. Inc. 5000 Magazine named RSM Maintenance to its list of Fastest Growing Private Companies list for 2014, 2015 and 2016. RSM Maintenance provides handyman, electrical, snow removal, landscaping, HVAC, plumbing and general repairs with their hybrid business model of self-performing technicians and a vast network of trusted business partners.